We can call super class constructor in sub class using super() call. 1. 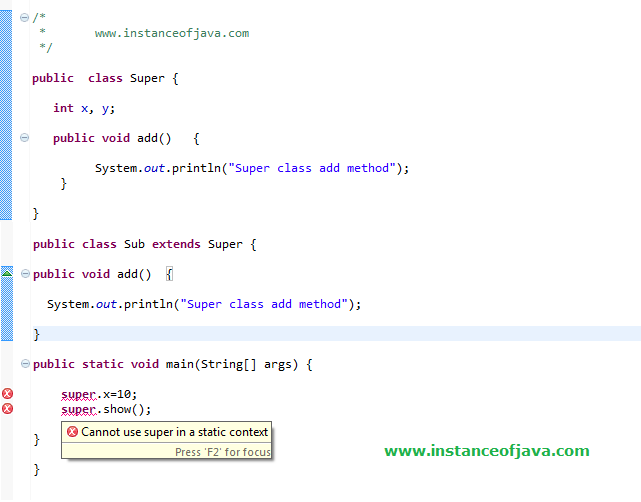 By using super keyword we can access super class variables in sub class. Using super keyword we can access super class variables from sub class. 2. By using super keyword we can access super class methods in sub class. Using super keyword we can call super class methods from sub class. By using super keyword we can able to call super class constructor from sub class constructor. For the super(); call must be first statement in sub class constructor. Super(); call must be first statement inside constructor. By default in every class constructor JVM adds super(); call in side the constructor as first statement which calls default constructor of super class, if we are not not calling it. If we want to call explicitly we can call at that time default call wont be there. 4.What will happen if we are calling super() in constructor but our class does not extending any class? Because in java every class will extend Object class by default this will be added by JVM. 6. Can we call super class methods from static methods of sub class? No we can not use super in static methods of sub class Because super belongs to object level so we can not use super in static methods. If we try to use in sub class static methods compile time error will come.